Among the stories of Rabbi Judah Loew ben Bezalel there are many tales of wonder, wit and wisdom. 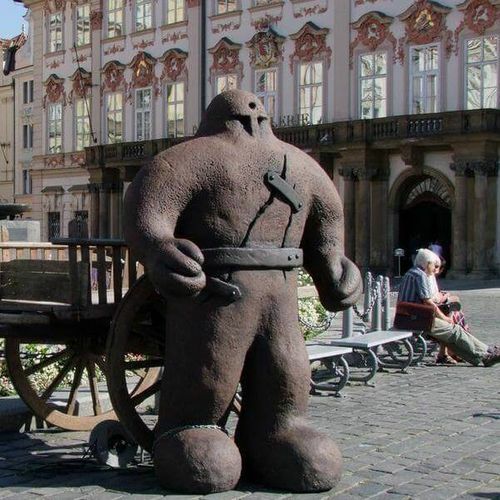 But one of the strangest has to be the story of the Golem of Prague. In the time of the Emperor Rudolf II, the Jewish community of Prague suffered great persecution. Each Passover, the Jewish Quarter lived in fear of pogroms, the pretext for these being the notorious blood-libel - the slanderous rumour that Jews used the blood of Christian children to bake the matzos, the unleavened Passover bread. The Emperor could not, or would not, protect the community. So the Maharal made a Golem, a man-made man, from the clay of the Vltava river, to protect the community in times of trouble: a Golem upon whose forehead was written the Hebrew word emet, meaning truth; a Golem who had the unutterable Name of the Most High on a parchment placed upon his tongue - giving him just life enough to obey his human creator, but no other sense of right or wrong. Each night Rabbi Loew removed the Name of the Most High from the Golem's tongue, and he slept. My bubbe would often say that every Jewish child was told the story of the Golem of Prague. She would always finish by telling me: He sleeps beneath the leaves - until we need him. When I was a little girl I would spend hours kicking up the leaves in the forest, hoping to find him. What little girl doesn't need a knight in clay armour? But I never found him. Years later, I realized that I had probably mistaken her point. I had always thought my bubbe had meant leaves from trees, but for her the leaves were pages of books and scrolls. For according to one legend the Golem sleeps in the attic of the synagogue in Prague, where the old books were stored. She had been telling me that the Golem lies asleep beneath old words. And so I think he may. This story of The Golem will be followed by a short-break before a half-hour or so conversational discussion about the Drut'syla storytelling tradition. "You hear people talking about the storytelling revival, but in Jewish culture it never died. From the age of four I lived and breathed the tales of my childhood, unaware that there was anything unusual. I thought this was quite normal and that all storytellers had this background ... It was quite routine for me to fall asleep at night listening to songs and stories in English, Yiddish, Hebrew, Dutch and Turkish - a wonderful colourful mix," Shonaleigh.